If you've ever had a run-in with poison ivy, poison oak, or poison sumac, you know the results: an itchy, blistering rash. The best way to prevent it is to avoid the plants. Poison ivy can be found in most parts of the country. Poison oak grows in the eastern states and along the West Coast. Poison sumac is found mainly in swampy areas in the Southeast. Although these plants look different, the damage they do is similar. An old saying to help people avoid these plants is "Leaves of three, let the be." That's good advice, but it doesn't go far enough. The leaves also may grow 5, 7, 9, 11, or 13 to a stem. Poison ivy comes in many varieties. It's common in wooded areas and also is found near lakes and streams. Poison ivy often grows as a vine, but it can also be shrub. The leaves are often the first to turn color-red-in the fall. In the spring the plant has yellow or green flowers or white berries. Poison oak takes two forms. In the East and South, it grows as a low shrub; along the Pacific Coast, it may be a tall shrub a high-climbing vine. The notched leave resemble those of the common white oak tree. The yellow berries grow in cluster. Poison sumac favors boggy areas. The tall shrub has 7 to 13 smooth-edge leaflets on each stem. The berries are pale yellow. The best advice is to learn what the problem plants in your area look like. Also, avoid any plant with black spots. Those are marks of urushiol, the substance in the sap that causes the rash. All parts of these plants contain the sap - not just the leaves but also the vines, stems, roots, flowers, and berries. Do not touch any part of the plant. The sap can last throughout the winter, so choose your firewood carefully! Wear long sleeves and long pants, even in hot weather. IvyBlock (containing bentaquatam, a chemical that coats the skin like clay) is FDA-approved to protect your skin from poison ivy. It must be applied 15 minutes before exposure, and then reapplied every 4 hours. If you are going to be handling plants, wear vinyl gloves. Urushiol can soak through cloth and even rubber, but vinyl is resistant. If you think you've come into contact with poison ivy or its cousins, react FAST. Quick action is the key. The sap will come off with water, but it is best to wash it off within 5 or 10 minutes. I recommend first washing the area immediately with rubbing alcohol. Then rinse well with plain water. Then hop in the shower, and wash with soap and water. Scrub under your fingernails, too, to get rid of any sap there. And, again, the key is to do this within about 10 minutes of exposure. Not easy, I know. Be careful not to rub the sap into broken skin or spread it to other areas of the body. For example, don't wipe your face with a gloved hand that has touched a poisonous plant. Launder clothes that may have come into contact with poison ivy. Be careful not to touch any sap that is still on the clothes. 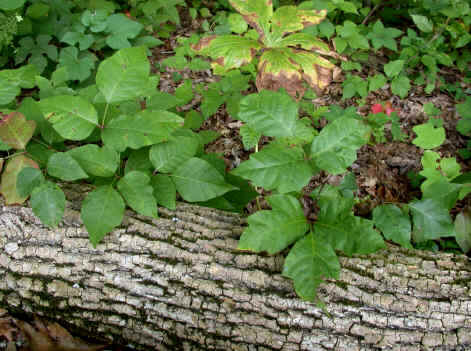 Unfortunately, the urushiol oil from poison ivy is hard to destroy - if you get some on your shoes, it can remain potent for years. After working in the garden, rinse off your tools with rubbing alcohol and then water. Avoid hugging a pet who's been romping in poison ivy until it has had a bath. Animals can carry the sap on their fur. Urushiol oil removers: Zanafel Poison Ivy Wash and Tecne are two products that claim to removed urushiol oil. There is no good evidence supporting these claims. Burt's Bees Poison Ivy Soap (an herbal product made with jewelweed) makes the same claim. There is no harm in trying any of these, other than their cost. If the itch is bad, your doctor will give you medication. Follow your doctor's instructions for taking the medicine. Most people find cool, moist compresses helpful. Oatmeal soaks (Aveeno) also bring relief. A lotion like calamine is soothing, but don't use products like Benadryl on your skin (you can use Benadryl pills to reduce the itch), which contains a drug that can make the rash worse. Try not to scratch, not matter how much you itch. Scratching can break the skin and lead to infection. You can't spread the rash by scratching, however, unless you have the sap under your nails. Clothing worn while hiking, gardening, or playing outdoors.